About two years ago, I decided that it’s not a good idea to constantly download unreviewed software written by untrusted individuals and to run that software with full privileges on my laptop. If I was telling a child how to avoid getting viruses on their Windows machine, this would be obvious and normal. But because I am talking about developing open source software on Linux, I find myself some distance from the beaten track. At first, I used a Debian package called schroot, which automates a lot of the work involved in setting up a permanent chroot. And in the last few weeks, I have been trialling LXC, a very similar technology which has recently matured substantially. At first, I used a read-only source directory, but I kept encountering cases where build systems want to write to their own source trees. MediaWiki now uses Composer extensively, Parsoid uses npm, and HHVM’s build system subtly depends on the build directory being the same as the source directory. So in all these cases, it’s convenient to give the build system its own writeable source tree. It’s possible to do this without giving the application the ability to write to the copy of the source tree which is destined for a git commit. The solution I’ve settled on for this is aufs, which is a kind of union filesystem. It is really a joy to use. I can edit source files in my GUI editor, and as soon as I hit “save”, the changes are visible in the build environment. The build system can edit or delete its own source files, but those modifications are not visible in the host environment. And if the build system screws up its own source tree beyond easy rectification (which happens surprisingly often), I can just wipe the whole overlay, instantly reverting the build tree to the state seen in the host environment. It is like git clean except that you can put unversioned files into the host source tree without any risk of accidental deletion. The lack of network isolation in schroot could be a problem if you have sensitive services bound to TCP on localhost. It’s possible to bring up network services inside the container — even ones that are duplicated in the host, as long as you use a different port number or IP address. It’s a little-known fact that 127.0.0.1 is only one IP address in a subnet of 16.8 million — you can bind local services in the container to say 127.0.0.2.
schroot is generally less buggy and easier to use than LXC. That’s partly maturity and partly the greater level of difficulty involved in the implementation of LXC. For example, schroot is able to process fstab files by just running mount(8), whereas LXC is forced to reimplement significant amounts of code from mount(8). It parses fstab-like syntax itself and has special-case support for many different filesystems. In LXC it’s normal to run the whole system as a daemon, starting with /bin/init — this is the default behaviour of lxc-start. There are lots of components that make this work, each with its own log file. Often, when I made a configuration error, lxc-start would print no error but the container would fail to start, then you had to hunt around in the logs, and turn on logs where necessary, to figure out what went wrong. In schroot, by contrast, a persistent session is simply a collection of mounts, there does not need to be any process running inside the container for it to exist. So session start is synchronous and error propagation is trivial. Session termination is implemented as a shell script that iterates through /proc/*/root, killing all processes that appear to be running under the session in question. schroot has some great options for root filesystem storage. For example, you can store the whole root filesystem in a .tar.gz file. When schroot starts a session, it will unpack the archive for you, which only takes a couple of seconds for a base system. By default such a root filesystem operates as a snapshot, but it can optionally update the tar file for you on session shutdown. I previously wrote some notes about how to set up MediaWiki under schroot. The procedure to set up an AUFS-based build system is almost identical in schroot and LXC. Let’s say we’re making a container called “parsoid” with a union mount for the parsoid source tree. My host source tree is in ~tstarling/src/wmf/mediawiki/services/parsoid , and I create an empty overlay directory writeable by tstarling in /srv/chroot/build-overlay/parsoid. The container root (/srv/chroot/parsoid) is created by directly invoking debootstrap. For more information on X isolation, see my followup blog post. I reviewed several SSL implementations for coding style: OpenSSL, NSS, GnuTLS, JSSE, Botan, MatrixSSL and PolarSSL. I looked at how buffers are handled in parsers and writers. Of all of them, I think only JSSE, i.e. pure Java, can be trusted to be free of buffer overflows. It suggests that a good webserver for security-critical applications would be Tomcat, without native extensions. Bounds checks are rolled up into an obscure calculation, then the code proceeds to memcpy() straight out of the buffer. PolarSSL was also similar in style. This makes auditing easier, and should be commended. However, it’s still a long way short of actually following CERT security guidelines by using a safe string library. And since this is an embedded library, it would have been nice to see a backend free of dynamic allocation, to allow verification tools like Polyspace Code Prover to provide strong guarantees. The functions are short, with short code paths between length determination and buffer use, which gives it similar auditability to MatrixSSL. But the potential security advantages of using C++ over C were squandered, and frequent copying and small dynamic allocations means that performance will not be comparable to the C libraries. So it seems that in every case, authors of C and C++ SSL libraries have found unbounded memory access primitives like memcpy() to be too tempting to pass up. Thus, if we want to have an SSL library with implicit, pervasive bounds checking, apparently the only option is to use a library written in a language which forces bounds checking. The best example of this is surely JSSE, also known as javax.net.ssl. This SSL library is written in pure Java code — the implementation can be found here. As I noted in my introduction, it is used by Tomcat as long as you don’t use the native library. The native library gives you “FIPS 140-2 support for TLS/SSL”; that is to say, it links to a library that probably has undiscovered buffer overflow vulnerabilities. Polyspace Code Prover is a commercial software verification tool. I exchanged many emails and four phone calls with Mathworks in order to convince them to give me a one-month free trial. Unlike my usual toolset, it is not “free as in freedom”, it is free as in “have fun with those FlexLM bugs, bwahaha”. But, I’m a pragmatist. PCP can be used to verify C, C++ or Ada code. It is mostly aimed at embedded software development. Contrary to the fears of the Mathworks sales team, it can be used to verify server software. Over the last few days, I’ve used it to find several bugs in PHP’s exif extension. It is awesome and probably smarter than me. It didn’t take long for it to start telling me things about the code that I didn’t know. The remaining orange checks can be acknowledged with saved comments on the analysis. PCP knows that malloc() can fail and return NULL, and will flag the dereference orange, to point out that you haven’t checked for that. This is, of course, a gross simplification of this fraught function, and leaves plenty of room for uncaught segfaults. PCP has a system for customising automatic generation of stub functions, called DRS. I didn’t have much luck with it — I found that progress was much faster when I just wrote the stub functions in C, following examples from polyspace/verifier/cxx/cinclude/__polyspace__stdstubs.c . DRS focuses on specifying valid ranges for numbers, which wasn’t a particularly useful approach for my test case. When adding include paths, “add recursively” is checked by default. You really don’t want to add /usr/include recursively. Those include paths are equivalent to -I options to gcc, except without system defaults. They need to be non-recursive and correctly ordered. Check Behavior > Overflow computation mode: should be “wrap-around”, to match the compiler. Precision: These options control the run time and model complexity. I’ve found precision level 1 and verification level 0 to be sufficient for initial exploration, and a run at that level takes a mere 40 minutes for my exif.c test case. A run to verification level 4 took about 10 processor-hours and maybe 1.5 GB per core of RAM. It’s probably good to have a long-running configuration prepared so that you can quickly start it to run overnight before you leave your computer for the day. It doesn’t seem to like assignment expressions, for example in the condition of an if statement. Well, who can blame it, I don’t like them either. The affected assignments were ignored. It miscounted the length of a string literal containing null bytes. I couldn’t reproduce it in an isolated test case. The engine sometimes failed with “Maximum number of users for PolySpace_Bug_Finder_Engine reached”. The solution for this was rm /dev/shm/sem.mw*. It’s not for the faint hearted. But, with patience, you can test code in a way which is mostly orthogonal to human code review, unit testing and fuzz testing. Powerful static analysis tools like PCP could make a valuable contribution to security testing of server code. My wife Angela wanted a clock for her birthday where its one and only hand would go around once per year. Sure, I can do that, I said. 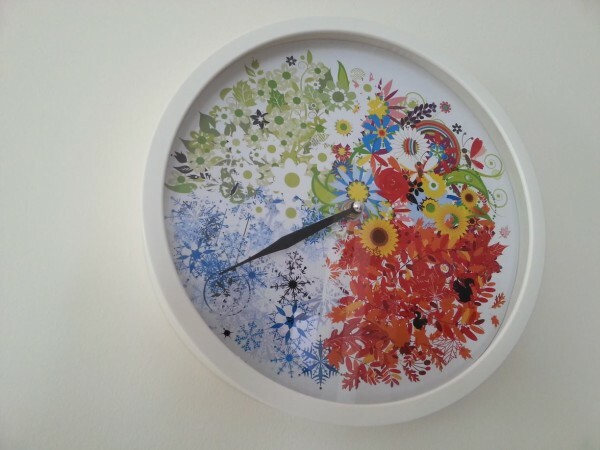 Angela chose a wall clock to modify, and chose artwork for the dial. 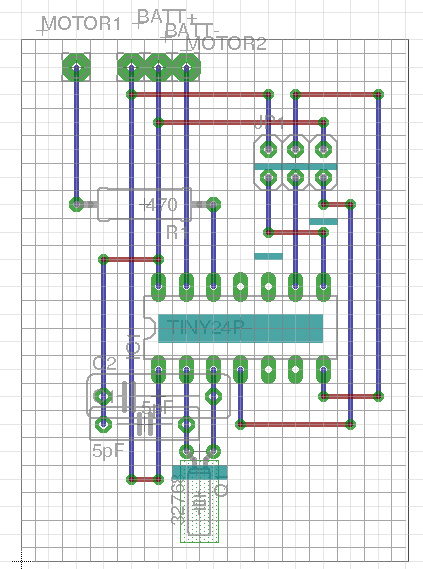 I designed and built the circuit, and wrote the microcontroller code. 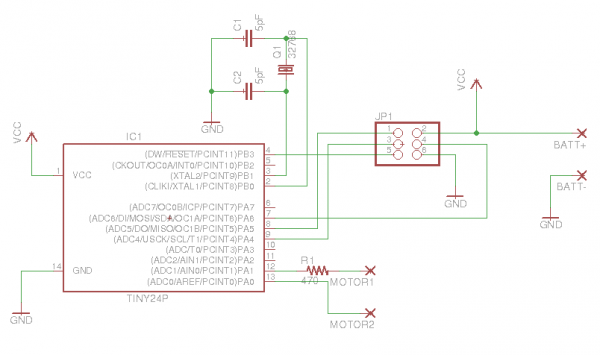 In-circuit programming made testing and debugging easy. I built the circuit on Veroboard. Blue lines are copper tracks, red lines are jumpers. Cyan marks the track breaks, which I etched out with a dremel engraving bit. I had to take the hands off to get the movement box open. The hands were made of metal barely thicker than foil, and it was necessary to use quite a bit of force to get them off the shaft. So I’m quite proud of myself for managing to save the minute hand and to get it back on to the shaft intact. It was somewhat scary pulling the movement apart and putting it back together again. It was necessary to take all the tiny nylon gears out to get to the motor connections. When I put the case back on, one of the gear axles wasn’t quite lined up correctly, and it bent through almost 90°. I bent it back into shape by hand, and it somehow still worked afterwards. The code is interrupt-driven. With a 32.768 kHz system clock in idle mode, the current draw was only 80µA, plus about 0.1µA average for driving the motor (3mA pulses with 0.004% duty cycle). So we can expect 3 years of battery life from a pair of AA alkalines. * attached to the dial, the minute hand will tell you what season it is. * to XTAL1/XTAL2. PA0 and PA1 are used as a virtual H-bridge. * According to Silicon Chip March 2008, a suitable pulse is 13mA for 100ms. * vicinity of 230 ohms. * Note: dial diameter 237mm. * counter variable, is used as the real-time clock. * LFUSE must be set to 0xe6 to enable the external crystal. // Tick with period 15845*1133/32768 seconds. // For testing, a square wave will appear on PA3 with frequency 1.034017 Hz.